Chennai has the pride of having the first Zoo in India. 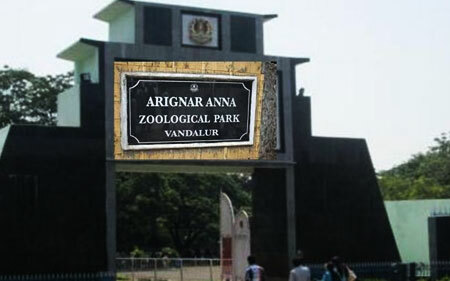 This Zoo was created in the year 1855 and was shifted from then Madras city to Vandalur reserve forest. Few years later by 1979 a renovated new Zoo was established in an area of 510 ha housing more than 170 kinds of species. The Zoo is wide with all basic needs for the animals. It has dry evergreen forest, undulating plain, Dry Island, hidden walls, caves, lush forests and sufficient water bodies. There are separate places for every animal, reptile, birds, and other creatures. There is also separate lane for visitors. This Zoo is well maintained and attracts lots of visitors every day. All the animal and birds here are well fed and well treated. The main objective of this Zoo is to create a better living atmosphere for the animals, and save them from extinction. It also focuses in creating awareness among the public about the wildlife. The other interesting aspects of this Zoo is, it provides lots of entertainments and adventurous events including Safari Parks for Lion and Deer, Jurassic Park, Reptile House, Elephant joy ride, Nocturnal animal house, Battery operated vehicles, Aquarium, Children’s park, Walk through aviaries, Education centre, and Prey - predator concept enclosures (Tiger - Sambar). The peculiar aspect of this zoological park is that, visitor are allowed to see animals at a hands distance, and they can even interact with them. There is a life size portrayal of prehistoric animals and their habitat, which is the most interesting part of the zoo. Visitors get the chance to meet all kinds of species including Asian elephant, Zebras, Lion tailed macaque, storks, Camel from South America, Highly endangered and endemic to Himalayan region Himalayan Black Bear, Pantheon and what not.